Riskiest Junk Bonds Still Blissful in La-La Land, High-Grade Bonds Bleed. Apple’s Fault? The Fed will keep tightening until these junk bonds buckle. The election in November 2016, after which the yield spiked. In December 2016, the Fed’s second rate hike in this cycle. This was when the Fed got serious and added an increasingly more hawkish – or less dovish – tone. But the market blew it off, yield fell again, and bonds returned to la-la-land. In September 2017, the Fed announced details of its QE unwind, and yields began to rise again and then started spiking in late-2017. This was when the bond market got serious. But at the riskiest end of the spectrum, with corporate bonds rated CCC or below (deep into junk), there is no such pain. In fact, the S&P bond index for CCC rated bonds is up 4.3% so far this year. They’ve had a blistering 82%-run since February 2016, when Wall Street decided that the oil bust was over and plowed new money into junk-rated energy companies. Before we get to one of the causes of this divergence between suffering high-grade corporate bonds and low-grade junk bonds partying blissfully in la-la land, here is another piece of the puzzle. The US Treasury two-year yield has surged since late 2016 and closed today at 2.53%. This end of the market is responding to the Fed’s tightening cycle. By raising rates and unwinding QE, the Fed wants to tighten financial conditions. In other words, it wants to make it a harder and more expensive to raise funds, and it wants investors to become more risk averse. This is the mechanism by which it transmits its monetary policy to the markets. But financial conditions haven’t tightened yet. These “financial conditions” show up in the FOMC minutes. In yesterday’s release, they showed up a dozen times: in summary, financial conditions tightened “a little” but remain “accommodative,” and this accommodation is what the Fed wants to remove. 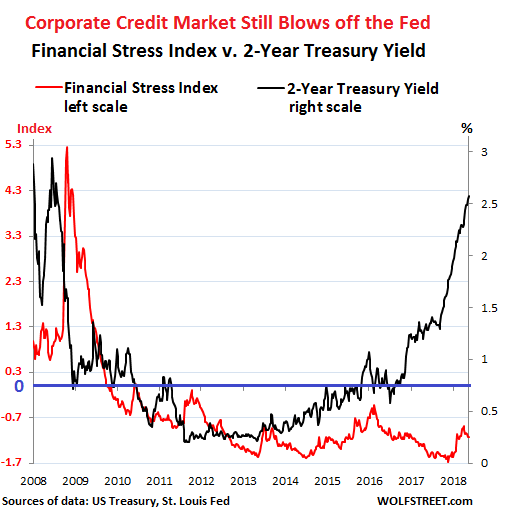 In the past, the two-year yield led, and the Financial Stress Index followed with a lag of half a year to a year. As the above chart shows, the lag is now wrapping up its second year. But eventually, financial stress will rise to catch up with the surging two-year yield. That’s when financial conditions get tighter and junk bonds get driven out of la-la land. There are a number of reasons behind this divergence between the pain of high-grade corporate bonds, and the bliss of CCC-rated junk bonds. One reason – a powerful one – is the new tax law. The new tax law encourages corporations with “overseas cash” to “repatriate” it under advantageous tax rules. But this “overseas cash” is neither overseas nor cash. It has been invested in all kinds of US securities, particularly Treasuries, often short-term Treasury bills to provide liquidity when needed, and high-grade corporate bonds. Now companies are repatriating this “cash” to buy their own shares. Share buybacks surged in the first quarter to more than $180 billion. To fund these share buybacks, companies are selling their bond holdings. This is a zero-sum game. Share buybacks in this quantity seriously prop up the stock market, but at the same time, they pull the rug out from under the bond market. Apple has promised a $100 billion share buyback program, the largest in world history. It has already embarked on it, and the once voluminous buyer of bonds has become a net seller. Other big companies have also piled into the game of selling their bond holdings to raise the cash to buy back their own shares. There is not a lot of liquidity in the corporate bond market. So this selling has an impact, which explains part of the pain in the high-grade bond market. And junk bonds? Companies don’t want to risk their “cash and cash equivalent” on risky financial investments. They tend to be conservative. Their risk-taking is focused on operational risks, such as developing new products that might flop or building new plants that might not be needed. So they don’t invest in risky securities, such as CCC-rated bonds. 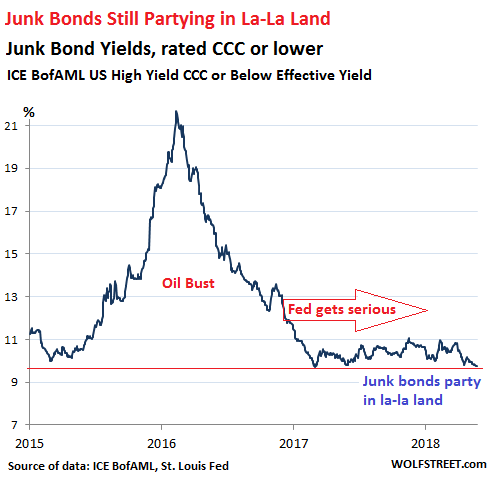 But now that they’re selling their holdings, there are no CCC-rated bonds to sell, and they can’t put pressure on the low end of the junk bond market from that direction. And that’s one of the reasons low-end junk bonds are still waiting to be driven from la-la land. ← Wall Street Mega-Landlords Piled into Spain’s Rental Property Boom, and Now it Hits a Wall? So, we should all short the hell out of HYG (iShares High Yield Corp Bond ETF) and make a killing over the next few months. Why am I hesitant to put major money on this bet? Any thoughts? I understand this, and appreciate your insight, but what is so crazy is that I own HYG as part of a diversified asset allocation, and since it is down compared to the other elements of my portfolio, I am getting ready to rebalance my portfolio which will require that I buy MORE of it! In the past, I have tried to use logic and research to tinker with my portfolio, and in this case, maybe staying away from buying more HYG. But, almost every time I have tried to be smarter, I would be proven wrong by the market, and in the end, would have made more money by just blindly rebalancing, and ignoring all the noise. This is what is so crazy and frustrating about investing, and perhaps why indexes beat the majority of active managers over time. I would like to think I am smarter than the indexes, but I ain’t. Hehehe – I was at the bank only yesterday. That made me laugh because those two are pretty much THE most volatile stocks currently available on the Copenhagen Stock Exchange (of course excluding the soccer club shares, which are IMO not only volatile but random also, like old AP-mines). Some asset allocation algorithm put them there. Probably to get some “uncorrelated vol”, possibly, it even works too. At least until correlation happens again. So, I’d just stick with what the asset allocation formula says. I think what you are saying, they aren’t selling CCC bonds because there are no buyers. The Feds interest rate policy is a deux la machina, no other CBs are raising rates, LIBOR is going higher because of credit concerns after the tax law transfer, or is global credit really tightening? If credit is contracting why wouldn’t the Fed keep the spigot open? Those CCC bonds represent real assets, like holding a dollar bill while dollars are disappearing assuming your aforementioned reallocation of corporate bonds into stocks, which is anathema to the Feds duty to grease the skids for more fiscal spending, and protect the dollar. (same thing – foreign investors will not buy our bonds at any rate if the currency is in freefall) Not only is the Fed dumping its balance sheet, corporate America is unloading theirs, and how does USG meet new spending much less monetize their current levels of debt. Agreed those corporate bonds aren’t disappearing just changing hands and in a rising rate environment top rated bonds issued at absurdly low rates lose value faster. Does junk suddenly get a higher rating? No, and credit ratings should slip, that’s what higher rates mean. 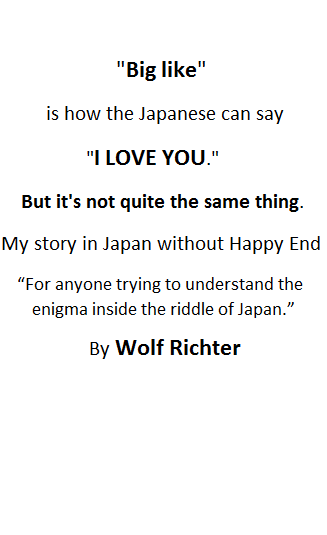 Puzzle where the pieces don’t fit. Shorting anything in these rigged, broken, manipulated markets is lunacy. Until fundamentals matter again, shorting is a good way to get your face ripped off by Da Boyz. re: the spread mismatch – IMO, the issue is that the current yield chasers don’t care if AA’s are yielding 2% or 3.5% – it’s meaningless to them. You’ve got fund managers who’d have a lot of explaining to do if they bought those yields while anticipating being underwater on them instantly. And you’ve got people (like myself) that don’t really care about 3.5% at all. I’d rather play equities until the music stops, where you make 3% in a good hour. At 5 to 6% AA, I would think about buying some bonds. Overall – with the economy (supposedly) in great shape, they junk and AA are really distinct markets, and not much crossover – I can’t imagine anyone saying, “Whoa – 3%AA, I’m going to dump my 10% current yield, and plow into that!”. IMHO – We’re just yet not at a perceived default risk where an indifference curve for the typical junk buyer is going to steer them to substitute with lower yields. The liquidity mismatch between high yield/junk bond ETFs and the underlying junk bonds is one of the reasons I don’t own bond ETFs. Your ETF assets will likely be frozen as soon as selling starts. Do you believe JNK Puts will pay off if JNK implodes? I believe XIV Puts paid off, but that was a controlled shut down. What happens if JNK opens at zero ? Are the options exercisable? I own hundreds of JNK Puts but wonder if I will see only paper profits if it implodes. The Fed- it’s done a really nice job on the “markets” – haven’t they ? In a country owned by private bankers and Wall Street – they’ll never do jail time for what they’ve done….. how sweet. Honestly, I don’t trust anything anymore, charts included. All that was in economics, accounting, and integrity has been tossed, the rules are broken and the methods to tally are rigged. The only data that MIGHT be true is old, months old and ‘revised’. How many times have you seen ‘revised’ or even looked for it? I see very young men and women (OK to say that now?) and have zero experience with or understanding of ….a house of cards coming down. Blindfaith and pure belief in ‘it is different now’ drives “investments” by funds and trading desks, that includes bonds, by ‘new experts’ who are barely 30. So the bond market thinks the FED is wrong…that is the message I am getting here. The bond market thinks the FED will have to lower rates not raise them, on the belief that the economy is not so good as we are told. Perhaps, but one must go back the idea that for more than 10 years imaginary numbers, and fantasy data have been created from almost nothing real. Just like cash and credit. As the 2 and 10 get closer to zero spread, the chance of inversion is just at the horizon. For the gambler, it makes those CCC bonds look delicious. We are either in or at, or close to a recession, but it will only be known as we look back from the fall of the year. I think the focus that is driving our economies over a cliff and that is, literally, making people de facto insane is the fetishization of “maximization.” No stone can be left unturned. No penny can be left on the table. Perfectly profitable categories of production are gutted, suffer from disinvestment, or are not even pursued as people chase the chimera of “maximization.” Nothing is good. Nothing is enough. Bankers in my father’s time lived happily on a three percent spread. They lived a nice middle-class lifestyle, worked reasonable hours, and got a paid vacation every summer with their kids. Now, a smaller number of them are rich as King Midas, work incessantly, and know no peace. This is insane. But it makes perfect sense when you worship at the alter of “maximization” and forget every other human value. 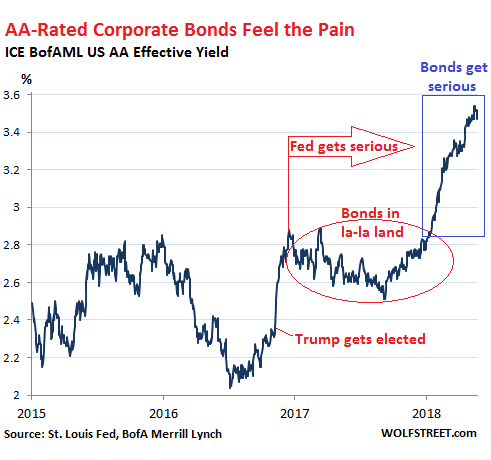 The bond market is split: The high-grade corporate bond market is grudgingly following the Fed and is preparing for more rate hikes. But on the riskiest end, they’re in total denial. Bravo for you in mentioning the key word: “Trust”! If the last crash taught anybody anything, it is NEVER to trust your banker again!! EVER! He may not even know what he doesn’t know and think that he does until he gets his T%& in the global wringer while all the while he thought he, “….had no exposure”! TRUST is a word long gone! Just revisited Irving Fisher’s ‘Debt Deflation Theory of Great Depressions’, and the closely correlated economic tracks between now and the what occurred then, is frankly striking. With all the current information and data available, what are the chances of a recession going forward? Be honest. Govern accordingly. Some folks are still recovering from the last one. Given the mild recovery, will the next recession also be “mild?” There’s not much left for them to take. For a lot of people the last one was 97-2000 and this 08 event is not yet over. When you use QE to Alleviate/Soften/Combat a correction event. Can the event be considered completed, until after the QE is unwound, and the results assessed? When you intervene in an economic event you frequently dont stop it playing out you just chage the way it plays out and the time it takes. Look at Japan that mess has been playing out for 40 years, triggered by the Plaza accord, and it still isnt over, by far. Can’t see the next recession being too severe since we’re still getting out of the last one. How much more they can take? The “system” can rip your financial heart out! And, claim, “National Security”……defending the currency. And you and yours will be left naked in a barrel! Let your imagination run wild and that will be where they will start. Are you asking can central bankers coordinate a response to a global financial crisis and the answer is not as well today as yesterday. what happens when everyone stays home and eats their own cooking? information is egalitarian, what matters is speed, and what does speed of information get you? enhanced speed of information allows you to speculate, not invest. there will be a recession or worse when the speculative premium in assets is drawn down, like 2008, when credit seized. govern, who? CA has the 5th largest economy, do they have an economic policy? The rise of populism is at the root cause of the breakdown in global policy, because of Americas military policy in the ME sending millions of refugees into Europe. So yes govern accordingly. As said by many people, in the US the effects of the new few Policy won’t be really noticeable until 2019.